As an adult, I have come to learn that cabbage is one of those foods that people either love or hate. 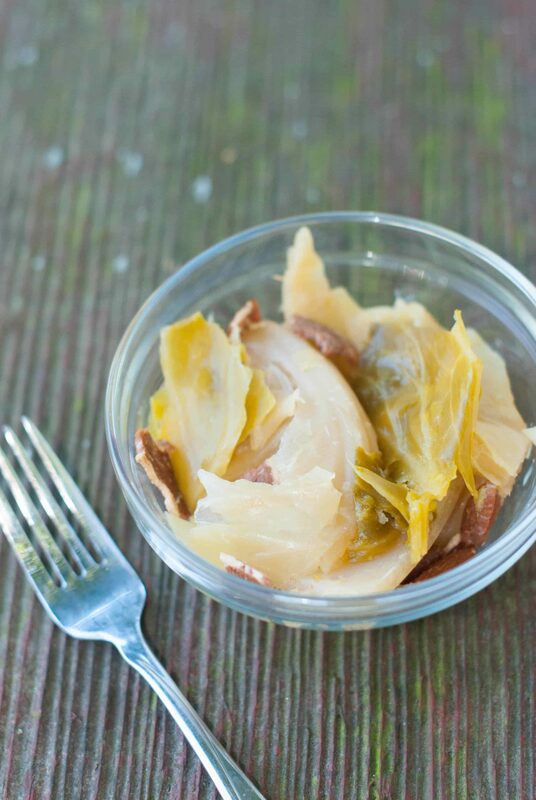 Growing up my family loved cabbage and we ate it in many forms all year long. Coleslaw in the summer, sauerkraut in the fall and cooked cabbage or stuffed cabbage leaves in the winter. In fact, I still think of cabbage as a comfort food on a cold winter’s day. My hubby however, hates cooked cabbage! He will eat it raw in slaw or salads, but never cooked, he doesn’t even like the smell. This was an especially sad revelation for me to have after we got married since I love it so much. So, I make sure to get my fill of cooked cabbage in the lunches I pack myself, at restaurants, or when he is out of town. One reason I think many people do not enjoy cooked cabbage is because it is usually cooked in such a way that it tastes sour or tart. Now, this doesn’t bother me one bit, but in thinking about this recipe I decided to create a more savory cabbage dish that has the potential to appeal to a wider group of food lovers. I based this recipe off of a recipe I recently created for slow cooker collard greens and sure enough it was delicious. 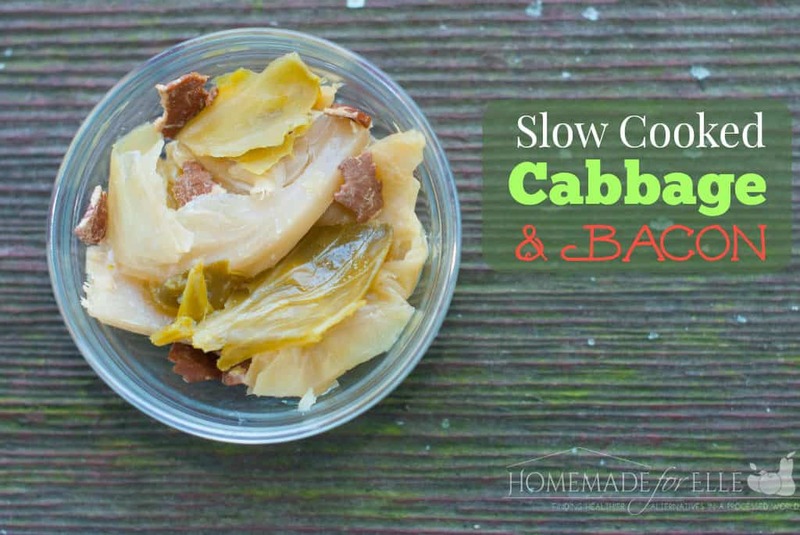 The slow cooker really allows the flavor of the pork to permeate the cabbage and create a delicious, mildly smokey flavor. This would be great served with sausage, ham, or a pot roast. Just the thought of it makes me imagine sitting down to dinner in front of a roaring fire on a cold winter’s night and just letting the flavors comfort me and warm me up! What are your favorite winter comfort foods? Is there a food your family hates but you love? Cook the bacon on the stove until translucent. Lay the bacon on the bottom of the crock pot along with the bacon drippings. Cut the stem off of the cabbage and divide the head into twelve sections. 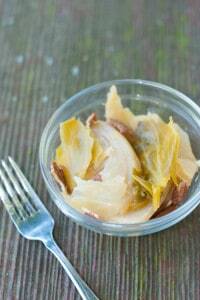 Add your pork bone and cabbage wedges into crock pot. Pour water over the cabbage and sprinkle your salt to the top. Cook for 3-5 hours on high. Can you elaborate on the pork bone? We generally do boneless pork… Do I just need to cook a pork roast that has a bone and then use that bone? Hello Samantha: I have really enjoyed your emails/recipes/blogs! By the way, Sweet Potatoes are one of my favorite foods! A super good cook/friend of mine cooks cabbage and collards together. My first experience to eat collards at all. Now this is a favorite of mine!